I feel like I've been on a cooking holiday. Cooking beautiful food, in beautiful kitchens with a beautiful friend. I was luckily enough to be asked to help cook for the AGM dinner of the Tasmanian convivium of Slow Food. A three course dinner for 50 using good, clean, fair food. We used beautiful organic produce, all sourced pretty much locally, except for a little flour, sugar and salt. I even contributed herbs and garlic from my own garden. Yay! Steenholdt Packham pears poached in pear juice and Frogmore Creek ruby pinot noir with Elgaar cream and clover honey custard (made with 72 yolks!) and walnut and wattle seed biscuit. Salivating, it all sounds so gorgeous. I love the slow-food notion and the low food miles is inspiring. Wow! It all sounds so delicious. Can I move in next door? Delicious. Those images are so enticing what a wonderful weekend! I am so pleased you are back and hopefully all feeling better after the flu. I love reading about your adventures. Wow michelle this looks and sounds amazing. There is such an abundance of wonderful food here it is important to celebrate it in such an enjoyable way. Beautiful photos. very impressed you cooked for so many people. Wishing I lived in Tasmania. What fun Michelle! The crackling on that roast pork looks divine, great job. 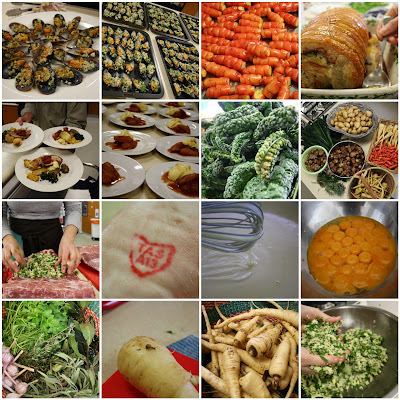 Tassie Slow Food Rocks! yum, poached pears would have to be one of my favourite winter treats! It all sounds so delicious. So jealous and perhaps drooling a little. Just wanted to let you know that you won my giveaway too so let me know your address and size. Oh my. What a great menu. You see I was hungry before I got on the computer. Now I am starving. Mmmmmm. You are a very clever girl.